Baglietto, the Italian-based shipyard with headquarters in La Spezia, announces the sale of the Baglietto 46m Fast to a Mediterranean owner. 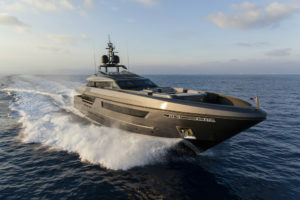 The 46m-yacht, worldwide premier at the latest boat shows in Cannes and Monaco will be named Lucky Me. 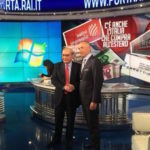 “We are particularly proud of this sale which comes from a professional effort of each single component of the Baglietto team –states Michele Gavino, Baglietto Managing Director– and it repays Baglietto for the courageous decision to build a brand new project completely on speculation. A tough challenge in terms of financial and technological commitment, including a new hull with no competition on the market and a revised layout”. “A challenge awarded by the market’s positive response during the latest boat show season –continues Alessandro Diomedi, Sales Director- and which find confirmation in the Owner choice not to make any change to the current layout”. Powerful, aggressive lines, further highlighted by the lead grey shade of the hull, characterise Lucky Me. 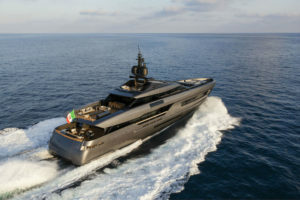 Following in the wake of the sleek aluminium planning yachts that have made the brand’s success all over the world, Lucky Me stands out for its streamlined bow and rakish lines expressing a strong personality, but can also boast an imposing stern with hawses, thereby maintaining the family feeling with previous Baglietto yachts. The trapeze-shaped windows in the hull alternate with rectangular ones arranged on two different levels, enhancing the slender shape of the hull and giving a more contemporary touch to the yacht’s highly charming outer profile. Another new element characterising the exterior lines is the compact shape of the superstructure, which is not too high to enhance aerodynamic penetration. 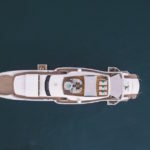 Great care is devoted to the outdoor areas, so as to allow passengers to be in closer contact with the sea when both cruising and at anchor, and to enjoy conviviality in the open air. 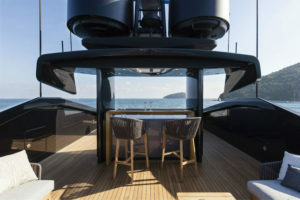 The aft area of the upper deck is indeed like a huge open terrace overlooking the sea furnished with a large table and a spacious sunbathing area. 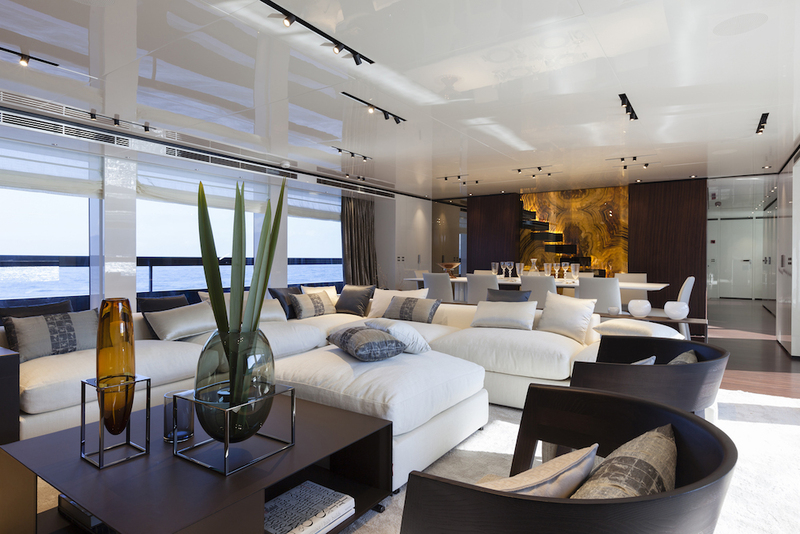 The interiors, also pencilled by Francesco Paszkowski Design together with architect Margherita Casprini, feature impressive volumes, rarely found on planning yachts of this size available on the market. 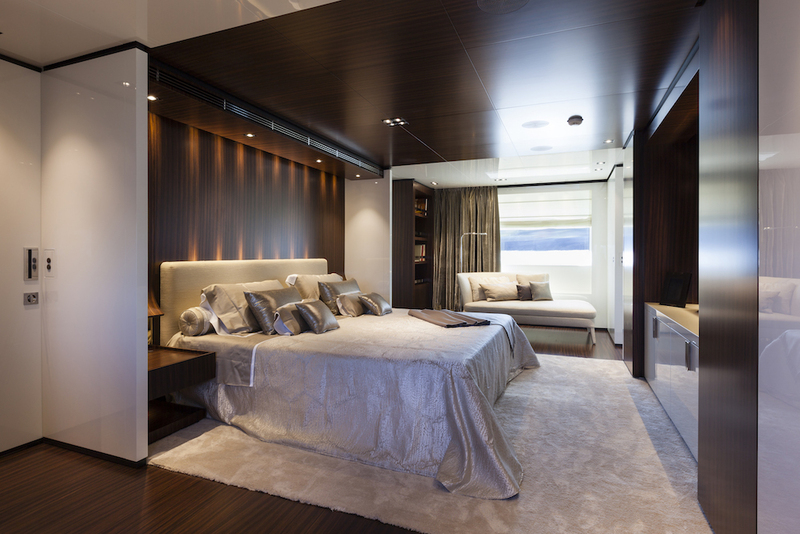 The warm shades of rosewood used for lining and floors alternate with the colder white lacquered ceilings and side panels across the entire boat, resulting in very refined, contemporary, stylish interiors. 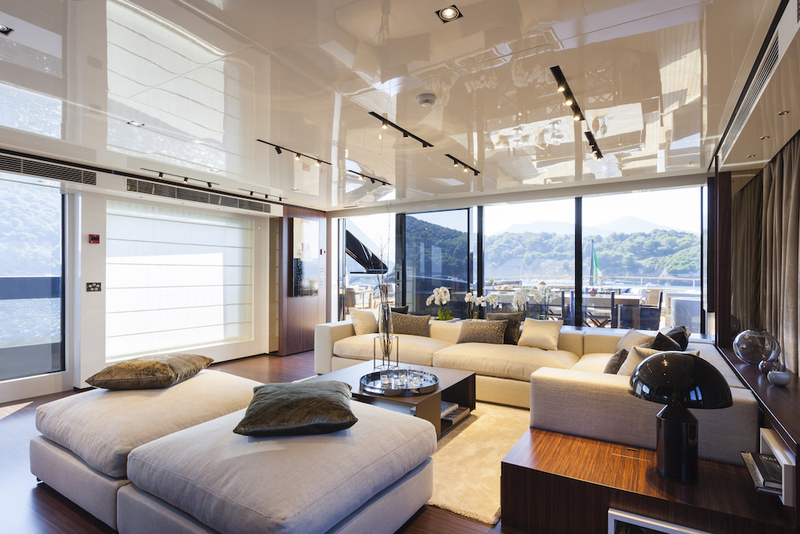 The layout features the full beam master cabin located forward on the main deck and the guest area on the lower deck. The upper deck is large enough to host a comfortable salon with conversation area, the captain’s cabin, and the wheelhouse, while the crew quarters, on the lower deck, include 4 twin cabins plus a single cabin and the dinette. The yacht, entirely built in aluminium, can reach a maximum speed of 26 knots thanks to twin MTU 16V4000 M93L engines; one of the most important naval characteristics is the reduced draft of 2,10 m (less than 7 ft) and for this reason she can easily cruise in shallow waters. The yacht is classified with Lloyd’s Register of Shipping and compliant to MCA standards.